Are You Looking For A Kenneth Williams Impression? As a professional voiceover artist and impressionist, one of my favourite voices to deliver is a Kenneth Williams impression. Kenneth is a legend of British comedy and the star of no less than 24 Carry On Films. His on screen persona was infectious and there was really no one like him on screen. There were many many facets to his character and as such, impersonating Kenneth is very tricky, but at the the same time a lot of fun! In the video below, I demonstrate how I approach my impersonation of Kenneth Williams. He has the most incredible and wide-ranging voice you will ever hear and there are many layers that we have to break down in order to encapsulate the true essence of the man. He was a true Londoner, born in Kings Cross and growing up in Bloomsbury and his accent can go from being very well spoken and RP (Received Pronunciation) to outright cockney in the same sentence! His speaking voice can be very considered, slow and precise one minute and then switch to being extremely fast-paced and animated very quickly. Enjoy this demonstration. 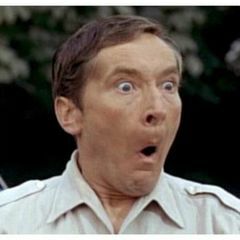 I’m often approached by radio producers and production companies who need a Kenneth Williams Impression for their advert and this is always a lot of fun to deliver, especially when I get to hear the finished advert, complete with sound effects and music. Check out these adverts. In the last one, I also throw in a cheeky Sid James impression at the end! I hope you’ve enjoyed the examples of my Kenneth Williams voice. He really was the most fantastic entertainer and comedy performer and I doubt if we’ll see someone as multi-faceted as Kenneth for a long time. If you delve into his private life, you’ll learn that he was incredibly complex and that I feel, is reflected in his personality and indeed his voice. If you would like more information on my voiceover services or need a Kenneth soundalike for your project, then please do get in touch and I’ll be happy to help.